Is a new project like the start of a new day? Is it an opportunity to collaborate, develop your career skills and build value for our customers? Do you look at each new project as an exploration of the possible or a slow dredging of careers, spirits, and souls through the mud of the improbable? We believe that “what starts well, ends well!” Moreover, to progress successfully through your challenging IT projects or portfolio you need Core Values to guide you. Why have Core Values for your project? To consider this, you should first consider why most projects fail? Lack of Communication or Organizational Readiness. There are many other reasons to blame for the failure of ERP projects. When asked what are the Core Values for your project team, we often hear “no problem, we have a charter, mission statement, project goals, and objectives.” Often these documents are a cut and paste exercise, taking the project initiation documents from the last project and editing them for the current project. Does this sound familiar? The problem, typical Project Initiation Documents are created at the beginning of each project to align purpose, goals, responsibilities and more. These documents are required by the PMO, sponsors, and auditors, but may not see the light of day once the project begins. Core Values drive the culture and behavior of your project! 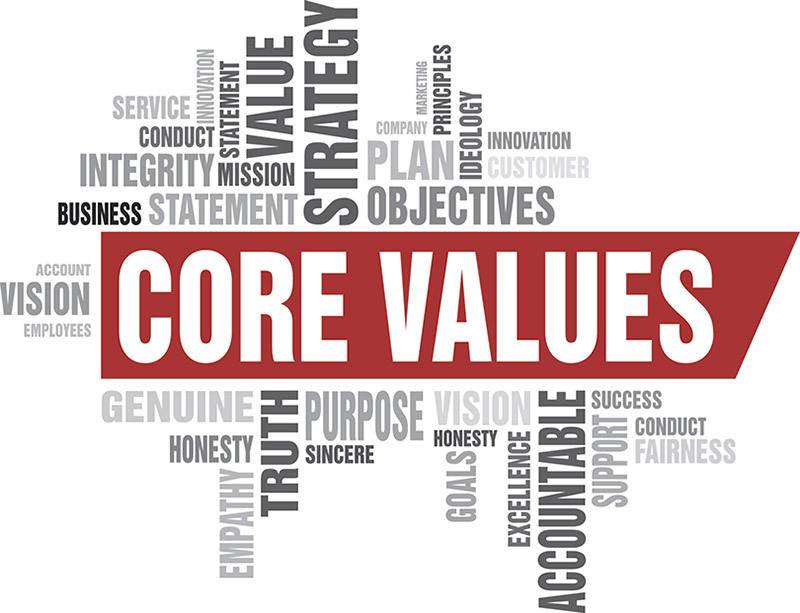 Are you convinced that Core Values are important? But that will not be enough to go through the process of Core Values discovery, convey your passion to others, and ultimately align the entire project team and stakeholders around them. Evolving companies like Zappos and Apple are known for their Core Values. These values define the culture and value integrity of the company. Your values apply equally to your projects. Values work well because they replace policy manuals, guidelines and rule books and guide action and behavior. Values outlive people, trends, goals, and challenges. Zappos leaders will tell you that values provide loose constraints; no rule book is used around expectations, but high integrity in behavior. When chaos hits during a project and you know it will values are essential to driving the norms for communication, trust, and action. Let’s review a few Core Values that align the PMO, Project Team, Business and IT organization. These values provide rationale, reasoning, and inspiration for enhancing your Project Initiation Documents with engaging and attracting the talent, investment, and resources that your project needs to succeed. We hear this from executive sponsors and project managers. How does your team respond to a value like this? We have introduced joint responsibilities in high-risk critical areas. One of our manufacturing clients had some significant work to clean up their material master data before conversion. The developer and the business lead were both experienced, but after a few false starts and much frustration, we re-defined the communication rules. To supplement the no-surprises value, we asked the fundamental question, “Can you run the business for the day with this master data?” At that point, we created a new value for success and simplified the expectations for the cleansing of the material master data. Work and words are open to interpretation – challenge objectively that there is agreement. Define the values that work for your company and project. The principle and benefit of values are universal. Don’t misinterpret that all values are universal and relevant to every environment. How do you work through the right values for your project team? Consider the primary failures of projects bulleted above. What Core Values could prevent such consequences and occurrences? Placing Core Values as the heartbeat of your project and following them through the good times and bad will help you to attract the best talent for your project teams. Team members will look forward to the project work as fulfilling and beneficial, and not a dead-end career move. Do you believe that what starts well, ends well? Every project also needs a post-mortem review to ensure continuous improvement of your projects and business. Click Here. Do you fall into the trap that your new projects look and sound just like your old projects? Do you have the confidence that these projects will succeed? If your project initiation steps need an independent review and assessment, contact Warren Norris, warren@titanconsulting.net, 972.679.5183; or contact your Titan Consulting Director. You can see additional information on our Advisory Services page at www.titanconsulting.net.